Today I’ve integrated Hazelcast with the @Cacheable spring annotation. I’ve chosen Hazelcast over EhCache + Terracotta, because it has a simpler configuration and there’s no need to run another deamon, which facilitates dev-environment setup. Please, notice the mode=”proxy” proxy-target-class=”true”. Without that configuration the beans with a super constructor and @Cacheable haven’t loaded. Notice that this isn’t a Hazelcast issue, it’s a Spring AOP issue, even if you use the SimpleCacheManager instead of Hazelcast one. I was wondering about using mode=”aspectj”, but it was taking too much time, so maybe another day. ATTENTION: CGLib proxies requires that the class needs to provide a default constructor, i.e. without any arguments. Otherwise you’ll get an IllegalArgumentException: “Superclass has no null constructors but no arguments were given.” This makes constructor injection impossible. Many people use JSP’s in a confusing way and end up with mixed patterns in the views. Server restarts and deployment kill my productivity. Spring-MVC: This one makes it easier to bind controllers and views together, simply using annotations. This makes it very easy to create well defined controllers before the execution of the view. Velocity: One of the most simple and powerful template engine available. With this I can define clear and simple templates that can access and interact with Java objects at the runtime. DCEVM: Dynamic Code Evolution VM. A modification of the Java HotSpot(TM) VM that allows unlimited class redefinition at runtime. In our case it will enable to deploy changes in java classes without restarting the servlet container. Since there are many tutorials on how to use these technologies singularly, this post will only cover how to bind these three technologies together. I would also suggest the usage of Maven to glue the dependencies together. Lately many people are excited about the Play Framework which adds speed to Java development. Personally, I don’t like being too tight to a framework, but it seems very good. I would recommend veloeclipse eclipse plugin for coloring the templates. There are many tutorials covering this part, like this one from velocity and this one from spring, but no one of them talks about WebappResourceLoader and how to use relative paths in the velocity templates and in the controllers. It’s very important to use org.apache.velocity.tools.view.WebappResourceLoader in order to facilitate development. Using ClasspathResourceLoader makes development painful because depending on your configuration it won’t reload the templates when you’re changing, or sometimes it will refresh the entire webapp context in order to refresh a single template. This process can take you minutes after each template change. Notice that no XML configuration was necessary, just the creation of the view and the controller. Also, thanks to DCEVM, there’s no need to restart the webapp after creating a new controller. After configuring spring-mvc + velocity, the most important part is to configure DCEVM in order to not need to restart our tomcat container after every change in the classpath. If you’re in a windows or linux environment, just open the jar and choose the JDK that you want to have the modified VM running. 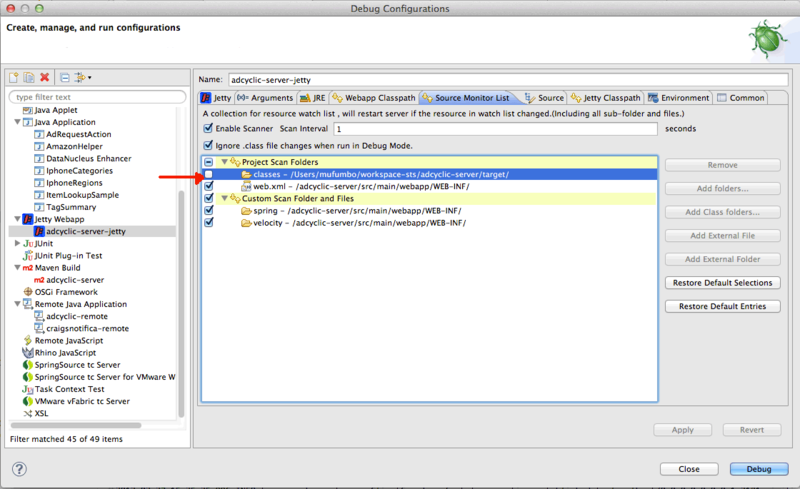 Notice that you can enable and disable DCEVM support for that JDK. On Linux only the 32-bit JDK is supported. After setting up the new VM we need to setup the eclipse project. Select the project properties and use the new JRE. Download tomcat and create a new server in eclipse, choose tomcat. Make it sure that your tomcat run in your newly created JRE. Go to the server “modules” tab and edit your project web modules. Disable “Auto Reload”. This is extremely important since it will save you hours and days of restarting time. Just run your tomcat and every time you make a change on your project it will be pushed to the server. No need to restart! If you like the DCEVM idea, also take a look into jRebel, which is even more powerful. Also, if you use the Datanucleus JDO database, don’t forget to install the JDO eclipse plugin, in this way your classes are compiled on the fly after changes, so no need to restarts for enhancement. Another simpler way is to install the Run Jetty Run plugin and run it over the new soylatte jvm. When creating your debug profile, remember to click in the JRE tab and choose the Soylatte VM. Running a jetty container with this plugin is 20 times faster than making a “mvn jetty:run”. This will make it possible to save your java files and velocity templates without restarting the server. One cool configuration that I’ve made on mine is that I added the spring and velocity configuration directories to the “Custom Scan Folder and Files”, so every time I change any files it will redeploy the webapp. Notice that redeploying the webapp with this plugin is 20 times faster than making a “mvn jetty:run” from scratch. server-side calls are better for Ad serving. Downside of AFMA/AdMob. Ad networks that offer server-side calls gives us a big advantage. We can simply get a image + link and print on a android WebView. Due to limitations of the android framework it’s the only way to have non-intrusive ads inside a WebView. Specially when the WebView must be layout_height=”fill_parent”, for a correct scrolling and zoom control. – Reduce APK size: I can implement my own WebView to print ads. AdMob SDK takes 140kb, Google AFMA takes 40kb, so 30% of my app is taken from ads sdk’s. – The developer have total control to optimize it. FYI: After the death of Quattro, the best network that is offering server-side calls is Millenial Media. My server was having a constant income traffic of 1.7mb/s for a service that download RSS from the internet and process them. Basically it need to return the last updates of multiple RSS feeds. It’s a very basic pooling system, but it was downloading too much data for just 15.000 active users. The growth wasn’t looking very feasible.. I was using the ROME java library to parse the XML. So far so good, the problem was that it downloads the whole feed and process it all. With my application scope I don’t need to download the whole RSS, just the new entries that i didn’t downloaded yet. The solution was to use a custom SAX RSS parser, looping through the “” tags and identifying “”. In this way i can parse item per item, and identify if the current item is not updated, so I can abort the http connection and stop the download of the feed. I wish that ROME had an option to do that, like “stop processing when ‘publishedDate’ minor than..”. If someone is interested I can post and explain the java class. It’s compatible with com.sun.syndication.feed.synd and uses the SyndEntry and SyndFeed interfaces. It’s very strange that PHP only support the “parse_ini_string” as configuration function. I don’t like it at all! It has problems handling quotes, new lines, and other caveats. This function can be used to create a php properties class. It should have the same behavior as the Java properties, so it should handle ” quotes and \ for new lines. Asynchronous master-slave replication, the no-frills industry standard approach. Consistent multi-master/update everywhere replication for scalable and high performance shared-nothing clusters. Zero data-loss inter-cluster replication over WAN for mission critical applications and disaster recovery. SEQUOIA is a database cluster middleware that allows any Java application to transparently access a cluster of databases through JDBC. You do not have to modify client applications, application servers or database server software. You just have to ensure that all database accesses are performed through JDBC. SEQUOIA allows to achieve scalability, high availability and failover for database tiers. It instantiates the concept of Redundant Array of Inexpensive Databases (RAIDb). The database is distributed and replicated among several nodes and SEQUOIA load balance the queries between these nodes. The server can be accessed from a generic JDBC driver, used by the clients. The client drivers forward the SQL requests to the SEQUOIA controller that balances them on a cluster of replicate d databases (reads are load balanced and writes are broadcasted). Slony-I is a “master to multiple slaves” replication system supporting cascading (e.g. – a node can feed another node which feeds another node…) and failover. The big picture for the development of Slony-I is that it is a master-slave replication system that includes all features and capabilities needed to replicate large databases to a reasonably limited number of slave systems.